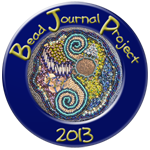 Should I bead butterflies or beach huts? I decided that if the butterflies were going to be as they are in nature there would not be many surprises as to how they were going to look so beach huts seemed an more interesting option. I am going to bead a beach hut for each of my family and friends. January is for me and I am very surprised by how it turned out. I decided to bead and leave the thinking about what different elements might mean till the end. My first reaction was ~ what on earth is going on! You see if you had asked me to draw a beach hut it would have been very traditional probably with blue and white stripes. Now as you can see no blue and white stripes in sight. I knew I wanted bunting and the heart shaped beads were the first choice I made. The square stitch needle woven flag was the last. I am kind of intrigued by the colour choices and by the different patterns I have ended up with. Some areas are quite neat and precise especially around the edges whilst at the centre is a very random blue door and I love my red windows. On reflection I can see it reflecting my personality. As much as I like a bit of order in my life and things to be fairly neat and tidy I am probably the happiest at home sitting in a creative jumble making something or on the spur of the moment taking off to do something unexpected on a blue sky, sunshine day. And those red windows are the colour of my birthstone garnet and how I feel about my home. Having started the year being ill there was no other place I would have been so cosy, warm and well looked after by my loved ones. What a wonderful beach hut! Looking at it just makes me smile, and smile. The colors, the shape, the door. The door! What a fabulous idea to bead a dwelling. I love the symbolism. Do you think what is outside reflects what is inside? Such a mystery. I can't want to see the next one :-) You also remind me I have to get going on my January project, ack! I love this idea - and how your first hut turned out for you. I've always been attracted to house blocks (I'm a piecer, not exactly a quilter) so I guess it's no surprise this has such a strong pull for me. Since I haven't yet actually started beading my project for January I may have to rethink my original plans! Did you ever see Artful Dreamers blog and her 2011 BJP of gorgeous encrusted houses? Thanks for your lovely comment.